This morning the alarm went off and I drifted back into la-la land. Usually by the 2nd alarm I’m up and getting ready to head to the gym or on my run. Feeling my leg muscles aching, I wondered if a day off from exercise would be good. Sleep till noon…you need the rest. Besides, your usual Friday morning long run will feel great after a rest. Just get up…go to the gym with the usual gusto to work out the kinks in your muscles and foggy brain. Take your time…enjoy a slower and more relaxed pace at the gym doing what feels right. What option do you think I picked? For those who said #3, you’re right! Sleeping in was not an option since my Catholic upbringing still haunts me. Staying in bed would make me feel so guilty, it would ruin the rest of my day. Usually I run from home to the gym as my warm up. Today, walking was a great way to start slow and appreciate the sights along the way. 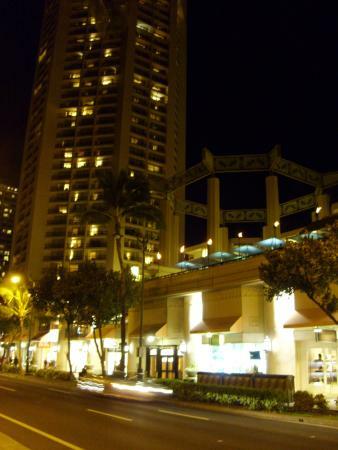 Walking on Kalakaua Avenue, in a little drizzle, at 5:30 am gave me an appreciation for all the other people out at that time of day. The people I saw don’t really have the choice to sleep in, like the cleaning people starting their early shifts at nearby hotels in Waikiki; the truck drivers who need to deliver produce and other supplies to hotels and stores before the morning crowds; the homeless people awakened by morning traffic and hoping for any kind of breakfast; and the half-asleep tourist pushing his wide-awake infant in a stroller, who have travelled half across the world to visit this beautiful paradise. Yup, this morning’s walk is another reminder of the power of choice-making. Thankful for having the luxury of choice, I arrive at the gym happy to get my muscles moving. Now, what should I do? What does leisurely mean at the gym? After walking around the gym, I settle for an easy ride on the stationary bike while I watch my favorite Canadian talk show, The Marilyn Denis Show, on my iPad mini. I set the time for 35 minutes and lose myself in the Show. The ride is a slow and easy pace – an interval workout enough to break a good sweat without taxing my muscles too much. I’m feeling good and glad to be around other people who chose to be here today. A quick and pleasant 40 minutes later, I’m considering what’s next. Thursdays are weight training days for me. So, what feels right today? Something that doesn’t need much thought, I decide. The weight machines seem to do the trick. They’re laid out for me, so just follow the path. In line with my leisurely pace, I decide that using lighter weights than usual is in order for today. I discover that it’s a great time to focus on my form and feel the muscles I’m working. It’s a powerful experience! With every movement, my muscles contract and then relax. My brain is so engaged as I feel the burn in my muscles – contract, relax, contract, relax. It’s a soothing rhythm that energizes me. Making my way through the maze of weight machines, I say hello to friends and acquaintances who make the trek with me. Some rush through, while others take their sweet time. Today, I don’t mind the person checking her phone while sitting at the lat machine. I might just skip that one today! That’s what leisurely means for me. Do what feels right and be happy with having made the choice to move. Walking home after my leisurely gym experience, I wonder about tomorrow. Today was such a refreshing change I might just run tomorrow without my Garmin GPS watch. Maybe no watch at all! This entry was posted in Fitness Tips, Motivational, Weekly Blogs and tagged fitness motivatiion, healthy living, love life, rest from exercise, Waikiki, wellness. Bookmark the permalink.